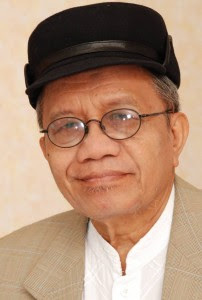 He continued his education at the Faculty of Veterinary Medicine and Animal Husbandry, University of Indonesia (now IPB), and graduated in 1963. In the years 1971-1972 and 1991-1992 she attended the International Writing Program, University of Iowa, Iowa City, USA. He also studied at the Faculty of Languange and Literature, American University in Cairo, Egypt, in 1993. Because the Gulf War, Taufiq back to Indonesia before the completion of language study. Taufiq Ismail during a student active in various activities. Recorded, he had become Chairman of the Student Senate UI FKHP (1960-1961) and Vice Chairman of the Student Council (1960-1962). He has taught as a language teacher at the High School Regina Pacis, Bogor (1963-1965), Introduction to Animal Science teacher at the Islamic School Darul Fallah, Ciampea (1962), and assistant professor of Management Faculty of Animal Husbandry, University of Indonesia, Bogor and Bogor Agricultural University (1961-1964) . Because the sign of the Cultural Manifesto, which was outlawed by President Soekarno, he was sent off for further study to the University of Kentucky and Florida. He then fired in the civil service in 1964. Taufiq a U.S. newspaper columnist in the year 1966-1970. Then, Taufiq with Mochtar Lubis, P.K. Squash, Zaini, and Arief Budiman Indonesia established the Foundation, who then gave birth to the literary magazine Horizon (1966). Until now he has led the magazine. Taufiq was one of the founders of the Jakarta Arts Council (DKJ), Taman Ismail Marzuki (TIM), and the Jakarta Arts Education Institute (LPKJ) (1968). Taufiq at the three institutions that have a variety of tasks, the Executive Secretary DKJ, Pj. Director TIM, and LPKJ Rector (1968-1978). After resigning from the task, Taufiq worked in private companies, as Manager of External Relations of PT Unilever Indonesia (1978-1990). In 1993 Taufiq was invited to be guest authors on Language and Library Board, Kuala Lumpur, Malaysia. As a poet, Taufiq has read his poetry at various places, both abroad and at home. In any event historic in Indonesia by Taufiq always read his poems, such as the fall of the Soeharto regime, Trisakti events, and the Bali bombing incident. In cooperation with the musician since 1974, especially with the Association of Music Bimbo (Hardjakusumah brothers), Tim Christensen, Ian Antono, and Ucok Harahap, Taufiq has produced as many as 75 songs. He had represented Indonesia read poetry and literary festivals in 24 cities in Asia, America, Australia, Europe, and Africa since 1970. His poetry has been translated into Javanese, Sundanese, Balinese, English, French, German, Russian, and Chinese. Dilakukannnya community activities that include a library board PII, Pekalongan (1954-56), with SN Branch and concurrently secretary of the PII Ratmana Pekalongan, Chairman of the Art Institute of Natural Minangkabau (1984-86), Founding Board of Trustees Foundation for Intercultural Development (1985) and is now its chairman, as well as working with the American Field Service scholarship agency, the U.S. organized a student exchange. In 1974-1976 he was elected as a member of the Board of AFS International Board of Trustees, New York. He also helped NGOs Furious (Antimadat Movement, chairman Sofyan Ali). In the anti-drug campaign he wrote poetry and song lyrics Â "War Drums NarkobaÂ" and Â "Youth Hymns Out of NerakaÂ" and composed Ian Antono). In this activity, along with four other community leaders, Taufiq received an award from President Megawati (2002). Taufiq is now a member of the Advisory Body Language, Language Center and Hall Book consultant, in addition to active as a senior editor of Horizon magazine. Taufiq Ismail Yatim Esiyati married in 1971 and has one son, Bram Ismail. With the family he lived in Jalan Utan Kayu Kingdom 66-E, Jakarta 13 120.